US intelligence agencies know that Michael Flynn, Trump’s National Security Advisor, had repeated conversations with Russian government representatives well before the election. We know that Russian hackers worked feverishly to hijack the election and give it to Trump during that period. Flynn, the former director of America’s Defense Intelligence Agency, knew very well that his telephone and text conversations with the Russians would be recorded by US intelligence, which is customary. To communicate privately with the Russians outside of American monitoring, Flynn would need to travel to Russia, and he did so several times. Flynn has been a regular (and likely paid) contributor to Russia’s RT.com, the Kremlin-run television, radio and web-based propaganda network. And Flynn paid to deliver a speech at a 2015 nationally-televised RT gala in Moscow, where he was seated next to Putin. We know that immediately after US intelligence agencies went public with their knowledge of Russian interference in our election, Russia arrested three of its FSB agents for treason. And just over two weeks ago, in late January, Putin likely ordered the murder of Oleg Erovinkin. The former KGB/FSB general was found dead in the back of his car in Moscow. Erovinkin was suspected of helping the former MI6 spy Christopher Steele compile his sensational prostitution dossier on Donald Trump. Understandably, Steele has gone into hiding. We know that throughout this debacle and well before the election, Trump gushed with praise for Putin, denying that Russia had thousands of military troops in eastern Ukraine and even suggesting that he, as president, might accept Russia’s illegal annexation of Crimea. Quid pro quo? And in spite of the Trump administration’s initial denials of any phone calls being made in this period, we know that on the very day that Obama announced sanctions against Russia, Flynn was on the phone again to Russia, this time actually discussing the sanctions according to American intelligence. On the day before sanctions were announced and the day of, Flynn made five separate phone calls to Russia’s ambassador Sergey Kislyak. We also know that Russia initially promised to retaliate for Obama’s expulsion of Russian diplomats, but after the phone calls, Putin instead invited the children of the US diplomats stationed in Moscow to a Christmas party at the Kremlin. At this point, Putin was apparenty confident that Trump would lift the sanctions. This was also a slap in the face to outgoing President Obama, and Putin expertly played Trump for the fool he is; Trump immediately praised Putin’s invitation. Throughout the chronology of all of these developments, Trump, Flynn, and others have denied the facts with lies. Each time they’ve been caught in the lie, they’ve repeated the lie again or fudged a new lie. There is a mountain of evidence strongly suggesting that the Trump campaign and perhaps Trump himself colluded with Russia to win the election, with the payback being that he would be Russia’s “inside man” as president. If true, then Trump, Flynn and probably others are, at the very least, guilty of treason. Now, US intelligence has reported that at least portions of the Steele’s incredible Trump dossier are true, which would give dangerous leverage over the American president to Putin. Trump has repeatedly denied any involvement with the Russian government or Putin, yet Trump’s history with Russia goes back thirty years. This Russia-Trump connection represents a grave threat to the US, and may well become a serious constitutional crisis. If Republicans refuse to investigate, if they choose to ignore the numerous reports coming from our own intelligence agencies and if newly appointed Attorney General Sessions refuses to act, then our constitution and the laws based on it will have no meaning at all. Having sworn to “support and defend the Constitution of the United States against all enemies, foreign and domestic” and refusing to do so, for the first time in American history the sitting president, the Republican congressional leadership, and the Attorney General will be in flagrant violation of that oath, and will lose all legitimacy to govern. Yet, things are strangely quiet. The present viral bloom of lightning-bolts’ outburst of collisions(using & repurposing the computer science sense of term ‘collision) and dilemmas could be read as a great victory for the engines of reason and progress, rather than a disintegration. Yes, Trump got elected, and yes there were extensive arrangements of things to make that appear A GREAT THING! The real insight here though, is that it DIDNT WORK! The explosion of scandal is not an indicator that nefarious forces have reached their critical point, but instead that the opposition to such has cleared the pole vault. It will continue to shake out over time, but my guess is that this burst of imbecility and criminality will mitigate for the pushers of public good, not autocrats, theocrats, or corporate abuses. Interesting screed that pretty much aligns with what my intuition of things has been. Good to see, as the professional news has different stories each day, and can’t fixate on repeatedly slamming through the hazardous topmost emergency story; not good for business model, listeners, and the precarious illusions of evenhandedness. Precarious *perceptions of evenhandedness. Hit send by mistake. Also, the repeated line on the prostitution/blackmail story I’d heard (NPR mostly? Uncertain) was that it hadn’t been corroborated. Haven’t heard a peep about it in months(?) tho. The news can often muddle and obscure one’s perception. Like they say with buddhism, a teacup is not to be filled with a firehose, and clear perception evolves from dropping the knowledge progressively, not accumulating it in ever more convoluted and discordant constructs. Was looking at that piece earlier, but didn’t reach the end; the seeming implicit statement was that there is a blanket of absolute badness over all now, yet I perceive that things are not ever absolute. Nor is it the only story, or the only existing thing about the subjects of story. Nor should one drop everything in a total panic to attack the singular problem. … Discarding all broken notions learned from fiction, past experience shows that life does, in fact, go on not only this minute and next year, but also next week. The republic/democracy was filled with glaring holes and contradictions before, and will continue to be after; I won’t declare it dead until it’s become entirely arbitrary to whims. Nothing’s ever existed as a perfect image of ideal. The fate of imperial Rome is unlikely to repeat itself here, not least because the modern technology landscape changes the game board completely, but there are also many other confounding distinctions. Which is not to say I would tell anyone that a complete destruction of law and country can be guaranteed not to happen. But it hasn’t yet, and probably won’t. But there will still be the Gordian tangle of contradictions, conflicts of interest, and legislated nonsense after Trump that there was before. Ask someone who worked on late Mac OS 9 about spaghetti code…. The news just doesn’t stop breaking on this story. According to the New York Times, four current and former US intelligence officials have revealed that the Trump campaign had repeated contact with Russian intelligence officials in the year before the election, IOW, throughout the campaign season. This was throughout the time that hackers working for Russia’s FSB security service were leaking hacked DNC emails to WikiLeaks and releasing volumes of fake news attacking Hillary Clinton. Of course Trump attacked the intelligence sources and said it was some kind of sour-grapes retribution for Hillary Clinton’s loss, which is typical Trump nonsense. According to The Observer, the NSA is reducing the intelligence it is sharing with Trump in the fear that it will be immediately shared back to Russia. The Trump situation can barely get any worse. We, the United States, are in serious trouble here. This post was written in a rush the day before Flynn resigned. As predicted, key Republicans including Jason Chaffetz, the Republican chairman of the House Committee on Oversight and Government Reform, refuse to investigate further. They are obviously afraid of what they will find. In my opinion, Trump is the most tainted and corrupt president we have ever seen, and Republican refusal to fully investigate the Trump administration’s connections to Vladimir Putin amounts to aiding the cover-up of multiple possible crimes, including treason. Watergate (yet another Republican debacle) looks like a candy theft compared to where Trump and the Republicans have taken us this time. At what point does a “democratic government” cease to be legitimate? 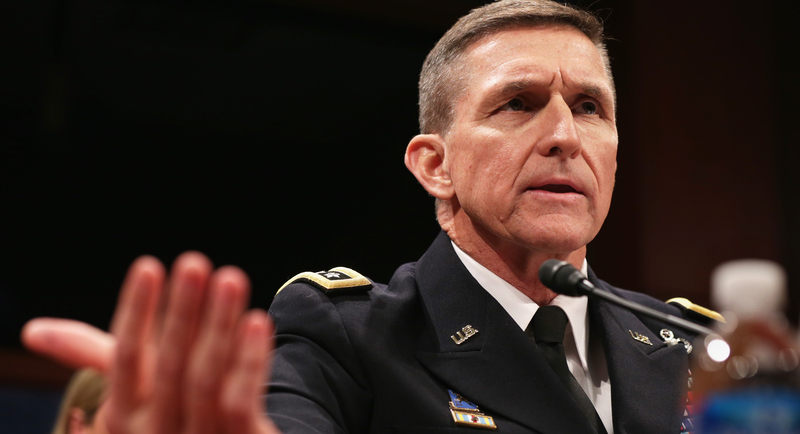 Flynn’s story is incredible. His connection with Putin blossomed immediately after he was fired by President Obama from his highly sensitive position as Director of the Defense Intelligence Agency, and this is very suspect to begin with. Flynn’s agenda has been largely ideological; he has long believed that the US should join with Russia to fight ISIS/ Al Qaeda, ignoring Russia’s atrocities in Aleppo and greater Syria, their annexation of Crimea, their military presence in eastern Ukraine, their efforts to undermine the Baltic states, Russia’s return under Putin to an authoritarian regime, etc. On Russia, Trump has been joined at the hip with Flynn, but only because Trump want’s some of Putin’s wealth, i.e., investment. Putin is rumored to be the richest man on Earth, but only because of his illegal takeover of key Russian businesses including oil and gas enterprises and the intimidation/jailing/murder of their former owners. As one would expect, for Trump it’s only about greed. This entry was posted on February 14, 2017 by Vox Populi in Opinion Leaders, Social Justice and tagged Daniel R. Cobb, Donald Trump presidency, Michael Flynn, The Sedition of Mr. Trump, Trump, Trump and Friends Treasonous From Day One?, Trump's ties with Russia.